East End Factory 500 Tour! This past weekend, Factory 500 members and their guests got an exclusive East End tour, going to three very cool and different locations. Thanks to Tom Stepleton, we have some great images from the evening! The first stop was the Pittsburgh Center for the Arts, where members were able to learn about an exhibition of Maxo Vanka's work called Paintings and Works on Paper. William Lafe gave the guests a tour and information during the hour spent at the Pittsburgh Center for the Arts. The Factory 500 tour previously visited Maxo Vanka's Millvale Murals, and since these new images in this exhibition have not been previously shown, it was an excellent chance to revisit his work. The exhibition will be on view through November 7th, 2010. The second stop was Tee Rex Syndicate / The Cotton Factory in Friendship. They specialize in screen printing tee shirts and other goodies. We received a wonderful tour of the facilities, including a display of finished products and a look at the shop, where the magic happens. Christian Shaknaitis led a demonstration of the screen printing process for the group, and the guests were even given a customized tote bag from the evening! The final stop on the tour was the Mansions on Fifth. This was a great chance to see a beautiful old building that is in the process of being restored. Bob Sendall, of All In Good Taste Productions, provided the guests with delicious treats, and the owners gave a history of the building and described the restoration process. Many thanks to both Bob Sendall, as well as Richard Pearson and Jennifer Pendleton for making us feel right at home. Many thanks to those who made the evening so wonderful! And as always, thank you to our Factory 500 members and their guests for coming to spent a fabulous evening with us. If you want to see more of the photos from the evening taken by Tom, you can check out our Flickr set. Hope to see you all for the next Factory 500 tour! Soandry’s debut performance in the U.S. on October 23, 2010! We are very excited to announce that Cuban hip-hop artist Soandry, formerly of the duo “Hermanos de Causa”, will be performing for the first time in the United States at the New Hazlett Theater on Saturday, October 23, 2010. Don’t miss this rare opportunity to learn the stories of the struggles and the triumphs of a Cuban rapper. Known for being a passionate free-thinker who shares the realities of life in Cuba, Soandry, is a leader of the hip-hop scene in Havana. 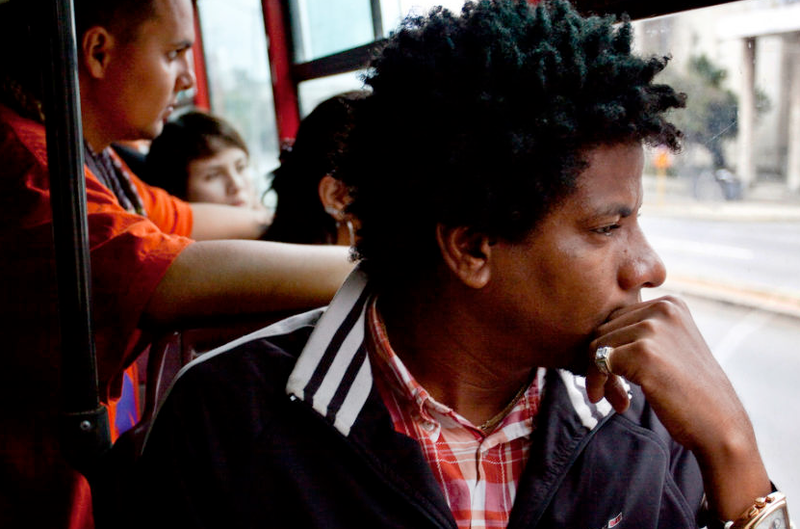 He shares a distinct socially conscious rap ethic that is uncommon in Cuba. His unabashed criticism of the Cuban government is audacious. Soandry was recently featured in the documentary about Cuban hip-hop entitled “East of Havana”. 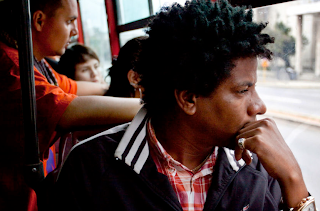 The film, which focuses on Soandry and two other underground Cuban hip-hop artists, has been deemed “A vital look at Cuba's tenaciously grassroots hip-hop scene” and that “For the youth in the film, music doesn’t just have a purpose, it is a purpose, and the artists find in hip-hop a 'mental freedom. '” The film will be screened on October 21, 2010, at the Mattress Factory with an introduction by the director. The event is free. One of my favorite things about working at the Mattress Factory is getting to see other artists’ work spaces and shops from behind the scenes. It’s a chance to get up close and personal with the artistic community in Pittsburgh. The Factory 500 member-only events really cater to the desire to see how other artists in the area live, work and create. This month, the Factory 500 Members are doing an East End tour that involves three stops. The night begins at 7 pm at the Pittsburgh Center for the Arts, and focuses on Maxo Vanka’s exhibition Paintings and Works on Paper. The group will spend about 45 minutes to an hour at each location, time-permitting. During the time, there will be a tour of the exhibition and talk about his work. Factory 500 members got a taste of his work earlier this year with a tour of Milvale's St. Nicholas Church covered in his own murals. The second stop will be at The Cotton Factory on Penn Avenue. 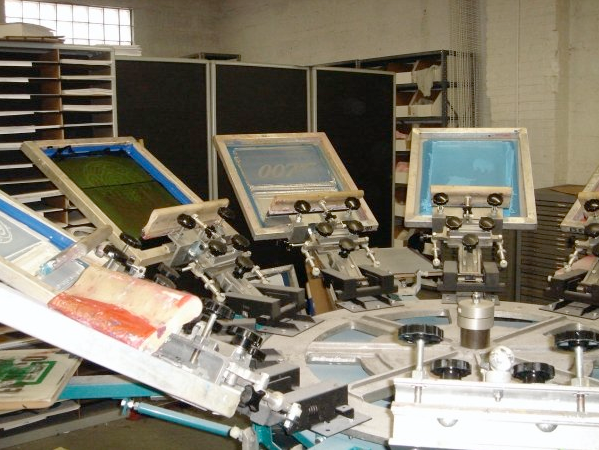 The Cotton Factory is a t-shirt and screen-printing business that ships orders nationally. They have t-shirt designs that range from Pittsburgh-themed to sarcastic and humorous to abstract. The group will spend time touring the shop and learning a bit about the processes at The Cotton Factory. The third and last stop for the night will be at the Mansions on Fifth. 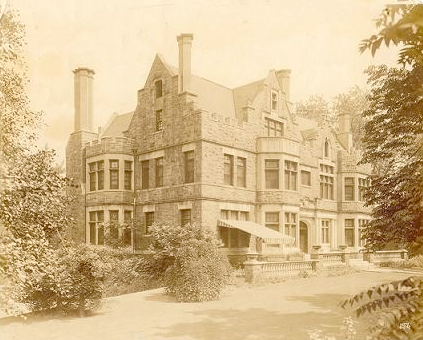 Currently undergoing a full restoration, the old building located on Fifth Avenue in Shadyside is getting a new life. The group will join Chef Bob Sendall, of All In Good Taste Productions, for delicious treats in the kitchen at the Mansions. As far as I’m concerned, it sounds like a great way to end the evening. These tours are always a lot of fun to plan and execute because of the wide variety of things to see and do. Our Factory 500 members really enjoy going to these behind the scenes tours, and I enjoy it, too. It doesn’t seem fair to just look at our own installation art here at the Mattress Factory; it’s necessary to step out into the Pittsburgh community and take a look at the other amazing things that are being created, whether visual arts, tee shirts, or delicious food. If you’re interested in coming along on this unique tour become a member at the Factory 500 level! 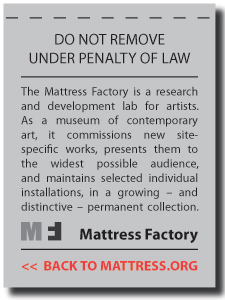 If you have any questions, feel free to contact me via email at abby[at]mattress[dot]org or call the museum at 412.231.3169 (and, yes, we can break down membership dues into monthly payments).